Raising a Black Boy in America? Not Easy! Congratulations, it’s a boy! Those were the words spoken by the midwife, after having my first son. Man, was I happy! But, on the inside my emotions were shaking like jello. But, despite my insecurities I was ready to take on the world, to ensure my son would grow up happy, and protected from a society that glorifies thuglife. At that moment, I thought “Heck! I can do this; my momma raised a strong, fearless, black woman.” Then, suddenly I realized that I would be fighting against negative forces in society waiting to devour my son like a sacrificial lamb. Damn! Raising a Black boy in America; this wasn’t going to be an easy job. Raising a Boy to a Man? Start Early! When I had my first son, I was still a new mom. This was my first boy and I wasn’t quite sure what I was supposed to do, in raising him. But, one thing I knew for sure was that I was raising a boy to a man! Despite my own insecurities, I knew I had to raise my son to one day become a responsible, man. And, there was no way to raise him properly, without starting the development process early. Therefore, my every action, in raising my son, was to prepare him for that eventual day, when he would stand, as a man, on his own two feet! It takes a strong woman to raise a boy to a man. It takes an even stronger woman to raise a thugless son! Despite our feelings of insecurity, we, as mothers, owe it to our sons to be strong, and give them the best guidance, counsel, and direction. And, no matter what—we shouldn’t give up! As mothers, we must be the dominate voice of reasoning that our sons hear. As a mother, I’m my son’s first teacher. I can’t leave that responsibility to someone else. If my son is lacking in social skills, then that’s a reflection on me; for the apple doesn’t fall far from the tree! My job is to nurture and cultivate my son, to take his place in society, and the world, as one who is responsible and productive. 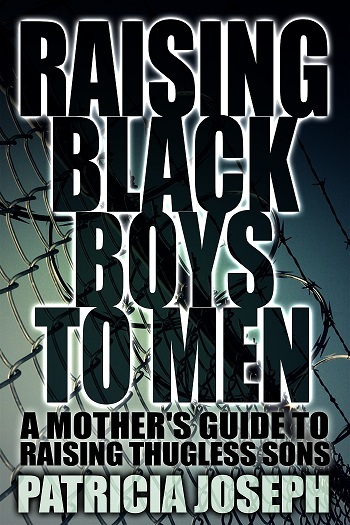 Raising black boys to responsible men takes strong mothers, who are committed and dedicated to raising men. When we, as mothers, fail in our commitment, then our sons lose. Raising boys in a large, urban city has its own set of challenges. There is much for a mother to contend with: peer pressure, drugs, and crime. Despite these challenges, I chose to do whatever was necessary to prevent my boys from getting caught up in the thuglife! Whether you’re raising boys with a mate, or you’re raising them alone, it takes a strong woman to raise a boy to a man. While raising my boys, I reflected often on my mother who raised me and my four brothers alone. She was a young widow and had to be both mother and father. One thing I remember about her, is that she didn’t play. When she asked us to do something, she expected for us to do what she asked without any objection. My mother was a strong woman. She didn’t allow for her unfortunate circumstance to get in the way of her mothering. Although, there wasn’t a father figure present, my mother provided love, but with a stern hand of discipline, when necessary.